Perhaps I should be standing next to a backdrop a bit more evocative of the preppy set lifestyle, à la Sarah Vickers (the blogger behind "Classy Girls Wear Pearls") based on what I wore yesterday. You know the kind of backdrop. Maybe a sailboat, a clam chowder stand in New England or a wood-paneled Jeep Wagoner should be somewhere behind me? However, yesterday we went to downtown L.A. where graffiti is abundant and sailboats, clam chowder stands and vintage Wagoners are nowhere in sight. Well, I certainly am no Sarah Vickers (who is?) but I am happy with this mishmash of the preppy meets urban chic. Maybe it's sort of like my personality or my style which is also an amalgamation of disparate, seemingly contradictory things. For some reason my eyes were closed or at least partially closed in many of the pictures, which is something Sarah Vickers would never allow in her blog, but hey I'm not perfect! Good thing I cut off my head in the photos like Marie Antoinette! Which brings me to the next part of my day: from preppy New England, to the graffiti laden streets of L.A. we move to Paris. My husband and I went to a Paris-themed bistro in L.A. for lunch. 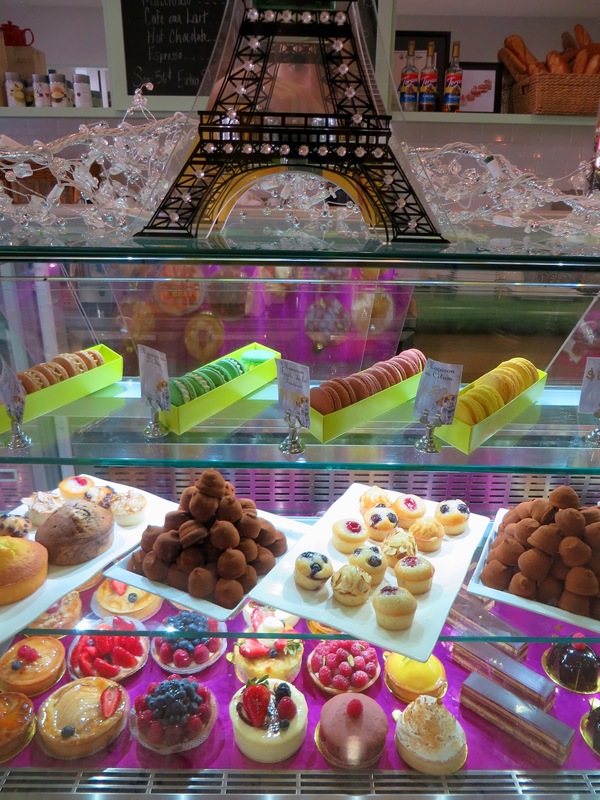 I would have taken home one of these delightful pastries featured above, but due to the fact that our lunch took over an hour to get (see I am not the only one who isn't perfect!) we decided to forgo the dessert. I guess I can just drool over the photo. Below you will see a few more details of my shirt and a few more examples of the vast amount of graffiti which can be found around most every corner and back alley in downtown L.A.
As sort of a side note, I watched a segment about graffiti as art yesterday on the CBS Sunday Morning Show. I also went to a similar themed exhibit at the MOCA a few years back. Perhaps just something to contemplate! You wear bright fun colors so well! I like this. It's preppy in a real sense. I find Sarah Vickers too fake for my taste. Thanks KDot! I like Sarah Vicker's blog, but it is like looking at a Ralph Lauren ad and not very realistic. I don't know how they have time to set up all of those photo shoots every week! I love your bold beautiful color and pattern mixes - you just make it work! Thank you Lisa! I'm really enjoying getting out all my bold colors for spring. As Tim Gunn says, "Make it work!" you are the queen of mixing prints! Thanks phiphi! How sweet! I feel like I still have a lot to learn about the art of mixing prints.